The playing surface of the Carrom Board shall be of plywood or of any other wood equally smooth and be of not less than 8 mm in thickness and of a minimum of 73.50 cm and a maximum of 74 cm square with its surface completely smooth. 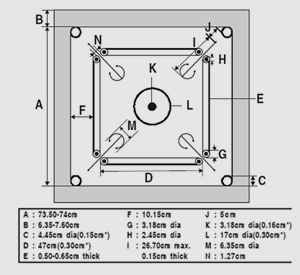 A Carrom Board shall be able to have at least three and a half runs of a normally smooth striker of 15 gms weight, when struck with the maximum force, from one of the base lines, to the opposite frame of the Carrom Board. Adjoining the playing surface of the Carrom Board there shall be wooden frames with inside curved corners made of Rosewood or any other hard wood with good resistance, with a minimum height of 1.90 cm and a maximum of 2.54 cm from the playing surface. The breadth of the frame shall not be less than 6.35 cm and not more than 7.60 cm. Suitable bracings shall be provided underneath the playing surface and fastenedwith the frame. a.Two straight lines of 47 cm each in length with admissible variation of 0.30 cm equally distributed on all sides, black in colour, shall be drawn on each of the four sides of the playing surface, parallel to the frame on each side. The lower of these two lines, which shall be between 0.50 cm and 0.65 cm in thickness, shall be 10.15 cm away from the frame and the other one 3.18 cm away from the lower part of the base line. b.The base lines shall be closed by circles of 3.18 cm in diameter at both ends.Within this circle a portion of 2.54 cm in diameter shall be coloured in red. These circles shall be called Base Circles. These shall be drawn so as to touch both the base lines and also the upper base lines of the adjacent side when imaginably extended. The distance between the base circle on one side and that of the other may be 1.27 cm approximately. Four arrows, black in colour, of not more than 0.15 cm thickness shall be drawn at each corner of the Carrom Board at an angle of 45 degrees to any of the adjacent sides and each of them shall pass through the gap between the two Base Circles and point towards the centre of the pocket leaving a clear distance of 5.00 cm from the edge of the pocket. The length of the arrows shall not exceed 26.70 cm. A decorative arch of 6.35 cm in diameter with a pointer at both the ends, drawn at the starting point of the arrows leading towards the pocket, is permissible. A circle of 17.00 cm in diameter with the centre point of the Carrom Board as its centre shall be drawn black in colour with admissible variation of 0.30 cm. It shall be called out the Outer Circle. Any decorative design in the circle is permissible.